When planning the perfect Thanksgiving dinner for friends and family, a table decorated with festive flower arrangements helps create an inviting atmosphere. Flowers are also a wonderful gift to present to your host or hostess if you are spending the holiday in someone else’s home. Dallas House of Flowers offers numerous arrangements designed with the Thanksgiving holiday in mind. Take a look at some of our leading options. 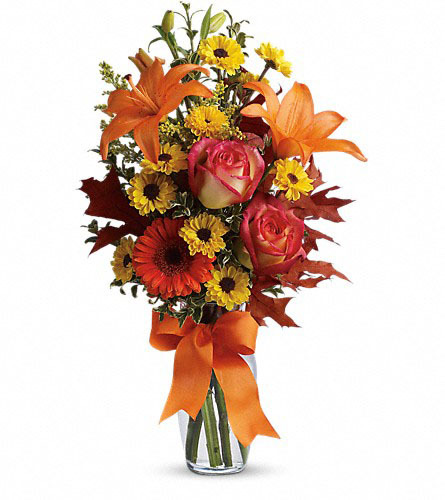 This arrangement features flowers in the warm fall shades of orange and yellow, with an array of oak leaves. Flowers include a mix of Asiatic lilies, Viking spray chrysanthemums, roses and a miniature gerbera. Presented in a clear glass vase with a bright satin ribbon, this bouquet will delight guests and hosts alike. This centerpiece is filled with yellow sunflowers, gold cushion spray chrysanthemums, red daisy spray chrysanthemums, oregonia, seeded eucalyptus, transparent brown oak leaves and two dark burgundy taper candles. It is available in three sizes, all delivered in a Bounty of Beauty bowl that’s perfect to match the holiday season. Displayed within a terra-cotta pot, this rustic-themed bouquet features chrysanthemums dressed in the yellow, bronze and green colors of autumn. It also features orange roses, seeded eucalyptus and hypericum, designed to offer the feeling of walking through the woods at the height of the changing fall season. This sophisticated centerpiece provides a distinctively autumnal glow, thanks to the two long orange taper candles that are set within an array of warm fall flowers. The Family Gathering Centerpiece is available in three sizes, all filled with orange roses, Asiatic lilies, dark orange alstroemeria, bronze button spray chrysanthemums and various shades of fall foliage. For more ideas on the perfect Thanksgiving flower bouquet for your home or to bring as a guest on your Thanksgiving travels, give Dallas House of Flowers a call. We offer everything from traditional Thanksgiving centerpieces to modern arrangements, and can customize a look that suits your needs. To learn more, call us today at 800-873-0917.